Prominent & Leading Manufacturer from Ahmedabad, we offer chain hoist, trolley hoist and mono rail hoist. 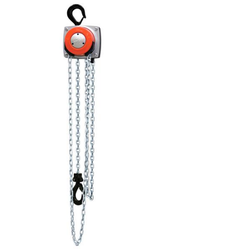 We have carved a niche in the industry by presenting a wide gamut of Chain Hoist. This hoist is manufactured using SS-312 grade iron alloy. The provided hoist is equipped with pulley that can be operated using manually or motor. Offered hoist has service brakes, lower speed topology, maximum grade-ability, battery operated system. Additionally, it is used for loading boxes, crates and other loading carriers. Apart from this, clients can opt for such hoist in custom specifications according to the business needs. At our well-established production unit, we are presenting Trolley Hoist. This hoist has full hydraulic system with projectile link between steering shaft and pump piston. The provided hoist suitable to replace the rear wheel and oil pump body. 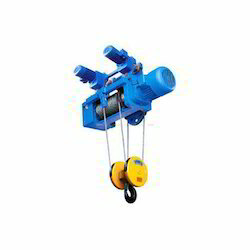 Offered hoist is made of utilized quality materials and advanced technology. Such fabrications aid in making the hoist aligned and accurate due to made of adhering to industry standards. Since our inception, we are affianced in presenting an outstanding quality array of Mono Rail Hoist. This rail hoist is made of using quality materials and iron alloy. 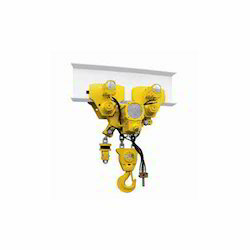 The rail hoist is designed and developed using advanced technology and innovative techniques. Provided rail hoist can bear the capacity of 10T per service. To provide string and robust structure, the rail hoist is developed adhering to industry standards. Clients can get the rail hoist designed and developed according to the business requirements.